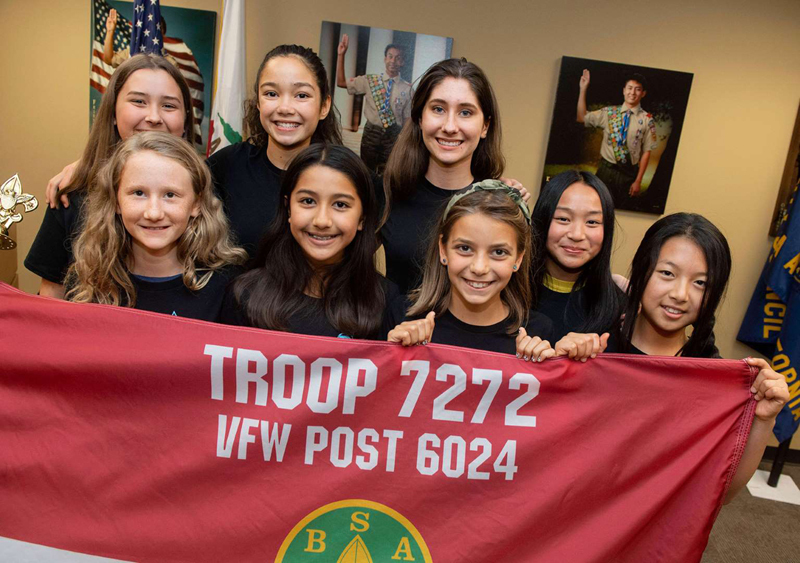 © KEVIN SULLIVAN—MEDIANEWS GROUP/ORANGE COUNTY REGISTER/GETTY IMAGES FUTURE LEADERS In Costa Mesa, California, eight girls from a new Scouts BSA troop pose for a photo. The Boy Scouts have been teaching leadership skills to kids for more than a hundred years. Now, the Boy Scouts are opening up to girls. On February 1, the first group of girls, ages 11 to 17, joined a new program called Scouts BSA. A girl will now be able to work toward becoming an Eagle Scout. That’s the highest rank in the program. “I could not be more excited for what this means for the next generation of leaders,” chief scout executive Michael Surbaugh said in a statement. Cub Scouts, the group’s program for younger kids, has been welcoming girls since last year. So far, more than 77,000 girls have joined. Alex Sobtzak has kids who are scouts. “I am so excited that my daughters will have the same opportunities as my sons,” he says.